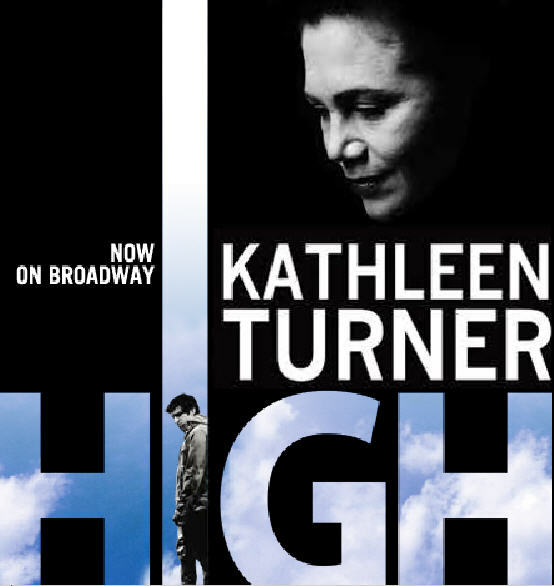 Last night I saw new Matthew Lombardo play HIGH at the Booth Theatre on Broadway. My expectations were high for a juicy role for Kathleen Turner and they were definitely met. Kathleen plays a tough, foul-mouthed nun who specializes in counseling for young addicts, Sister Jamie Connelly. She is struggling with ther own fears and past while attempting to counsel a nineteen year old drug addict Cody played by Evan Jonigkeit (Broadway debut) and fighting with her superior Father Michael played by Stephen Kunken. Kathleen is very funny as the nun. She's not typical - no habit, no giant cross, but modern and no nonsense. She's had a life before the convent. However, aside from the cursing and wise cracking, she reveals along the way that her life of service is perhaps her way of running from that past, but she is committed to her faith and to helping her charge. She displays great vulnerability and there was at least one scene that terrified me. I thought Kunken and Jonigkeit were effective in their roles. Each had their own issues, the priest trying to do the right thing and the suffering kid who has never had a chance. Overall, it was a riviting experience and I'm very glad I had the opportunity to see Kathleen in another play and particularly this play which examines shame, forgiveness and faith. Unfortunately, this play is closing on Sunday, April 24th - only tonight, two tomorrow and the Sunday matinee left to see a legendary performance. 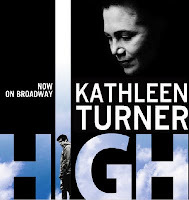 HIGH plays at the Booth Theatre on 45th Street.